Enhance your leadership and management skills, expand your network and take your career to the next level. The Executive Master of Public Administration (Executive MPA) offers a unique forum for exchange, learning, and professional development with a diverse cohort of peers. It is a springboard for participants who want to take their career to a new level. Executive MPA participants are equipped with cutting-edge knowledge and tools to lead teams and organisations, shape decision-making and manage change in the workplace. Courses in the Executive MPA are taught by renowned international faculty and experienced practitioners. The Executive MPA is a springboard for participants who want to take their career to a new level. One of the two courses can also be an additional course of Module 1 or 2. Participants choose two Skills Trainings as well as a 4-day Workshop in either Brussels or London. Many courses of the Executive MPA programme can be booked individually or in combination as a certificate. Credits earned and fees paid for a seminar or certificate can be fully transferred to the Executive MPA programme, as can be seen here in this example. Registrations for executive trainings are accepted throughout the year. Executive MPA participants come from over 35 countries and have gained professional experience in more than 40 countries. The average Executive MPA participant is 36 years old and has ten years of professional experience. Many study part-time while continuing to work, thanks to the programme’s flexible structure. Full and partial scholarships are available for excellent candidates and applicants with specific profiles. Tuition fees are fully tax-deductible in Germany and some other countries. Many employers cover tuition fees in full or in part. Contact us. Hear from our Executive MPA alumni - What drives Riefqah Jappie, Executive MPA 2013, is helping create opportunities through good trade policies. The programme starts in early September. Applications are reviewed on a rolling basis. The selection committee may decide to invite preselected candidates to a phone or Skype interview. Early application is strongly encouraged. 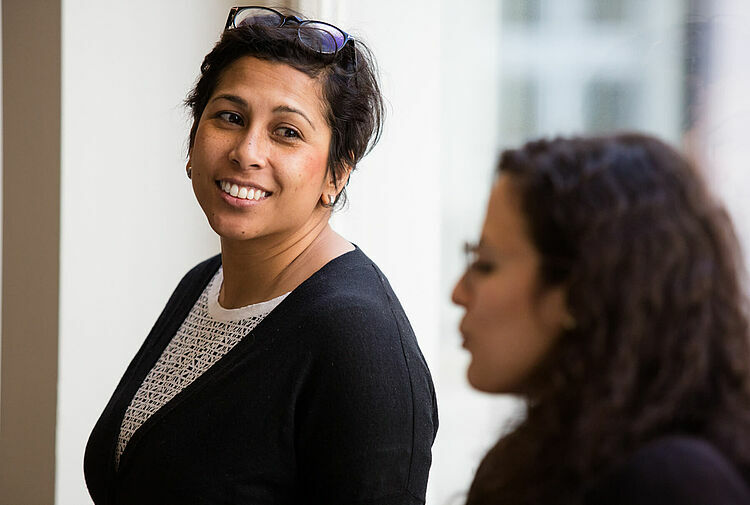 Request more information about our Executive MPA and receive updates on deadlines, financial aid and opportunities to get in touch with the Hertie School community. Robert Stemmler leads a team of researchers in 25 locations around the world. Upcycling to serve social, environmental and business goals: Carolina Rius founded a new business in Cambodia. Recruitment and admissions team visits the US, South America, Europe and more.